06-03-18 Towan Lodge accepted the challenge laid down by Carlyon Lodge and claimed the Travelling Gavel. W. Bro. 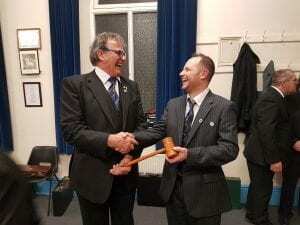 Keith Perkins (WM-Towan) proudly receiving the Travelling Gavel from W.Bro. Mike Eslick (WM-Carlyon). The Travelling Gavel was presented to Worshipful Brother David Bray of the Three Grand Principles Lodge (No.967) in 2008 by Worshipful Brother Jack Treganowan of the Copper Country Lodge (No. 135), U.S.A.
To claim the gavel, five or more members from one visiting Lodge must attend the meeting of the Lodge holding the gavel. The gavel can only be claimed by Lodges within the Province of Cornwall. The gavel cannot be claimed at an Installation Meeting. The gavel can only be claimed at festivities after the Lodge is closed. When you claim the Gavel, please add the date and your Lodge name and number to the travel document which accompanies the Gavel. This then shows how far and wide the Gavel has travelled. Please email your details to the Travelling Gavel Website Editor, as well, so that people can see where the Gavel is. Click HERE to access the official mileage chart. To access the complete travel list of the Gavel please click HERE.